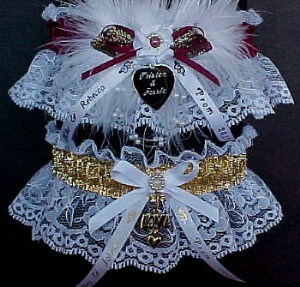 Personalized Garters for Prom / Wedding / Bridal. Custom Garters. 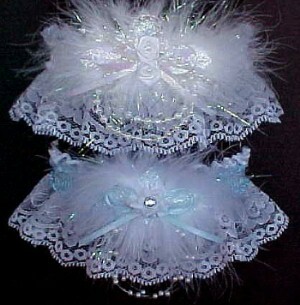 Bridal Garters - Wedding Garter Set Lace Wedding Garters. Custom Accessories Garters introduces Fancy Bands™ Wedding Garters. 2019 Wedding Bridal Trends and Ideas. 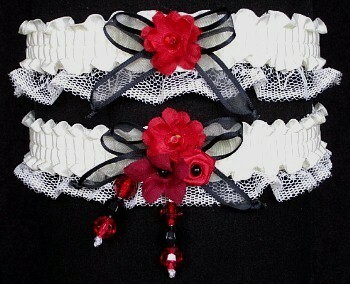 The Bridal Garter in Traditional Keepsake & Toss Lace Garter set are Custom made. The traditional Blue Satin Band Garter is available on White, Ivory or Black Lace ready for your Wedding and Garter Toss. A new 2019 addition is the multi colored Garters 'Colorful & Classy' Set Collection on ivory lace. 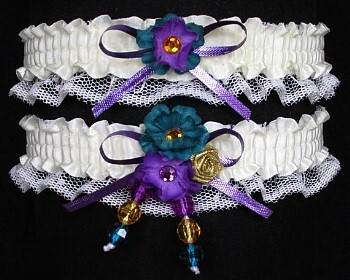 The Keepsake & Toss Wedding Bridal Garter set makes a great gift for the bridal shower or the bridesmaid attendants. A Unique Garter for her Wedding. Also available in Plus Size Garter. Garters for Wedding. Garters for the Bride. Keep the tradition. Prom Garters & Homecoming Garters Prom Garters - Custom Made. The Prom Garter tradition for the designer Senior Ball Garter, unique Junior Prom Garter, or Personalized Prom Garters in black lace, white lace, or ivory lace are ready for Prom night. See the latest 2019 Prom Trends and 2019 Prom Ideas. 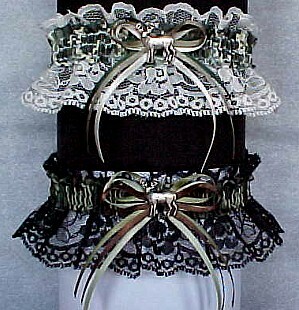 Fancy Bands™ Prom Garters are Custom Leg Accessories for Fashion and a Prom Garter Tradition for the Prom Dance. The Prom Garter is available in Black, White or Ivory Lace and trimmed with Pearls, Mini Roses & Hearts and perfect for prom night. We offer over 175 Colors of Satin Bands for the Prom Garter to match the Prom Dress; or a Prom Garter with Glitter and Glitzy Glitz metallic Gold or Bling with metallic Silver Band to match her jewelry. Also added are the new Neon colors for more pizzazz. Custom made Prom Garters with Feathers or Rhinestones. Gold or Silver Engraved Heart Charms, Personalized Imprinted Ribbon Tails, or Teen Charms are ready to attach to our Garters for Prom. Very up-to-date are the Cola Polar Bear Prom Garters and Twin Polar Bear Cubs Prom Garter for 2019 or the Camo Prom Garter. The latest addition is the multicolor Garter 'Colorful & Classy' Set Collection. One Keepsake garter for her and one to give to him. The best prom garter selection online. From a savvy Pink Garter to a Red Hot Garter with black lace and ready for Prom; we have it all. Prom Garters custom made. 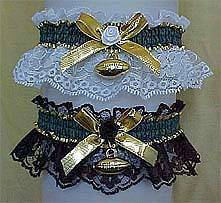 Fan Bands™ Garters Sports Wedding Garters. NFL Football, NBA Basketball, Baseball, Soccer, or Hockey Fan Bands™ Sports Garters are Custom designed for Professional or College Sports Fans and available in Team Colors for All Sports. Show your support for your favorite Professional or College Football, Basketball, Baseball, Soccer, or Hockey Sports Team and be an outstanding Fan with this Garter. Cheerleader Spirit Garters & Homecoming Garters in all colors. Biker Bands™ Garters New Garters you won't want to miss are the Biker Bands™ Garters for the motorcycle enthusiast. We offer a black lace Hog Biker Bands™ Garters with a Hog Charm attached and Chain Mail Biker Bands™ Garters with a Motorcycle Charm attached. The Best Garter for a Biker Wedding. Custom Theme Garters We offer a variety of Custom Themed Garters which include Angel Garters & Cupid Garters, Betty Boop type Garters, Camouflage Garters & Garters for the Hunter, Green or Desert Tan Camo Garters, Cami, Military Garters & Patriotic Themed Garters, Leopard Print Garters, Zebra Print Garter, & Polka Dot Garters, Western Garters & John Deere Tractor Themed Garters, Fishing Garters & Nautical Themed Garters, Dragon & Dolphins Theme Garters, Garters for All Sports like Bowling, Golf, Car Auto Racing Garters, Custom Baseball Garters, Basketball Garters, Soccer Garters, Gambling Lucky Lace™ Garter, Band of Luck™ Garter, Polar Bear Garter, Moose Garter, and Grizzly Garter. Patriotic Garters for Republican RNC, Democrat DNC & RWB Tea Party Garters. Unique Garters. Also available are numerous Custom Theme, Sports, Mascot & Teen Charms to choose from that can be attached to our Custom Accessories Fancy Bands™ Custom Themed Garters. Unique Garters and Much More! All Garters are in an individual clear acetate box.